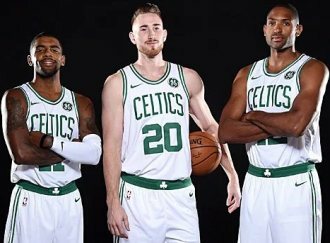 For putting together an outstanding roster featuring three All-Stars in their respective primes -- Kyrie Irving, Al Horford, Gordon Hayward -- pair of young stars on the rise Jayson Tatum and Jaylen Brown and a handful of high-end role players coming off the bench Terry Rozier, Marcus Smart and Marcus Morris, it’s no wonder that the Boston Celtics are favoured win the East and topple, too, the Golden State Warriors from Their NBA throne. The Celtics, too, have multiple future first-round picks to deal if they want to make a run at the next disgruntled superstar to hit the trade market, including a 2019 Kings’ pick that is only top-one protected. Thus, the Celtics’ impressive ceiling could be raised even higher this season if general manager Danny Ainge raises his chips on the table. What separates the Celtics from the rest of the field is its synchronized organizational greatness -- the front office, coaching staff and players are all exceptional at what they do. The best is Ainge has done to the roster was hiring Brad Stevens as the head coach. Stevens is a plus in all aspects of coaching. His player development skills are on par with Gregg Popovich’s, his ability to build a program resembles Steve Kerr’s work in Golden State, and his preparation and in-game play-calling is unrivaled. The number of wide-open looks and easy baskets the team gets off sideline-out-of-bounds and after-timeouts inbounds plays – that is all coaching, and Stevens is the best at it. He’s the type of coach who can swing an entire playoff series (just ask the 76ers). The combination of Ainge’s roster construction and Steven’s player development has yielded a top-flight team, which is an impressive feat considering Boston doesn’t even have a consensus top-10 player. The Celtics are at least two-deep at every position with experienced players. Steven’s lineup has the types of players a championship team needs. If he wants an alpha dog to get you a bucket in the last two minutes of a playoff game, he has Irving. Need a rotation of wings to throw at LeBron James, Kevin Durant or James Harden, he has Tatum, Brown, Hayward, Morris and Semi Ojeleye. If the need for an intelligent, selfless star to anchor the defense and play as a de facto facilitator on offense, Horford would be the best in the league at that role. In addition to all of that, the Celtics have the ultimate scrapper in Smart and a sixth man who might be a top-20 point guard in Rozier coming off the bench. The Celtics’ ability to throw waves of talented players at opponents is matched only by the Warriors. The road to the Finals is fairly straightforward for the Celtics. Adding Hayward to a roster that won 55 games last season and boasted the second-best defensive rating in the entire NBA is an ingredient for 60 wins and the top spot in the Eastern Conference standings. They’ll want the No. 1 seed because it’s less likely that they’ll have to play both Philadelphia and Toronto, each of whom present its own unique challenges for the Celtics. The 76ers have two players, Joel Embiid and Ben Simmons, who have higher game-to-game ceilings than anyone on the Celtics. The Raptors, on the other hand, have arguably the best player in the Eastern Conference in Kawhi Leonard and the lockdown defenders to hold even the most explosive offenses under 100 points. That being said, the Celtics still have the coaching and depth advantage over both teams. In many ways, the Celtics are built in the mirror image of the Warriors. Both franchises placed an emphasis on shooting, three-and-D wings and versatile big men who thrived in small-ball lineups before the rest of the league realized that basketball was heading in that direction. It should come as no surprise, therefore, that the Celtics play the Warriors about as well as any other team, going three-and-three against them in the past three seasons. If Irving and Horford could play Curry and Cousins to a draw, a Celtics-Warriors series would come down to how well Boston’s wings could match up against Durant, Green, Klay Thompson and Andre Iguodala. The odds will not be in their favor, but the Celtics are probably the only team in the East that could theoretically beat a fully healthy Warriors team.